Filled with vivid color and evocative of memories, this modern landscape tapestry "Tuscan Archway" represents the work of artist Jill Schultz McGannon. An artist of beautiful landscapes and countrysides, this artist has a flair for color and evocativeness. She studied in the university of Georgia and travelled throughout the US and Europe as a source of inspiration. Here we see a wonderful work of an archway which leads the viewer's eye through the arch and into the scene of beautiful golden leaved trees and poplars with a path that leads the eye again, on a curved path into the distance. The sky is a brilliant peach and blue combination that graces the skies only in particular moments in the afternoon. 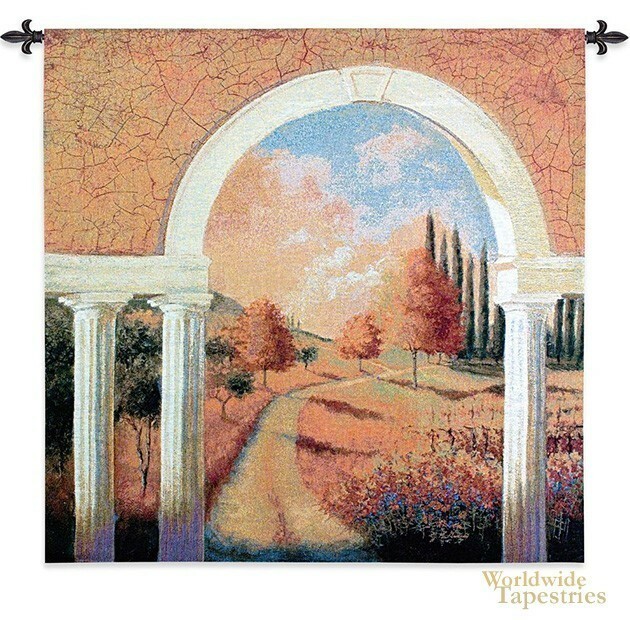 This modern landscape art tapestry "Tuscan Archway" is backed with a lining and has a tunnel for easy hanging. Note: tapestry rod and tassels, where pictured, are not included in the price.